He was 26 and eager. He was 63 and experienced. 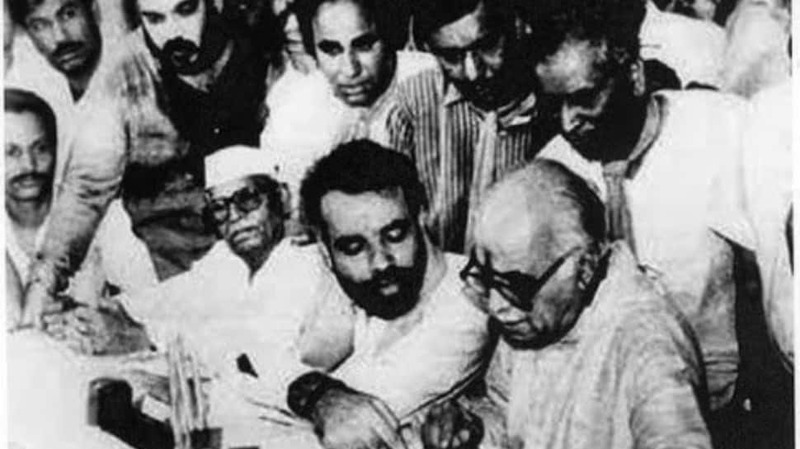 In 1991, when seasoned politician LK Advani filed his nomination papers from Gandhinagar for the Lok Sabha election, a young Amit Shah was by his side. Shah would go on to help the Bharatiya Janata Party leader in his campaigns and towards his eventual triumph. Shah and Advani painted quite the picture of youth and experience coming together for the cause of the political party they swore by – and still do even if from differing spectrums of age and influence. Fast forward 28 years and into 2019, Shah will contest from the very same Lok Sabha constituency from where he had helped Advani all those years ago. It is said a generation changes every 25 years and in BJP’s case, it took three years more. Gandhinagar would be an all-too-familiar territory for Shah and memories of 1991 are likely to make a comeback. Still only an activist of party’s youth wing Bharatiya Janata Yuva Morcha, which he joined as a 23-year-oldin 1987, Shah showed promise and potential to rise through the ranks. It is perhaps for qualities like these that he even got the opportunity to campaign for Advani, who would eventually go on to win by over 1 lakh votes. In fact, the Gandhinagar Lok Sabha constituency has been a fortress for BJP since 1989 with Advani winning from here on six occasions – the latest was in 2014 when he scripted a win by a colossal margin of close to 5 lakh. Advani’s string of triumphs here was hardly surprising considering the stature he enjoyed in the country’s politics. If Atal Bihari Vajpayee was the moderate face of a young BJP, Advani was its more forceful reflection. And in the early parts of 1990s, his contribution in the Ram Janmabhoomi campaign had propelled the BJP to its uncharted heights. If Advani was working at a national level at the time, Shah was busy at the grassroots level with most of his political time in the 1990s being dedicated to rooting out Congress from rural Gujarat. Along with Narendra Modi, Shah has been credited for creating a solid base for BJP in rural Gujarat which eventually helped the party become politically unsurmountable in the state. Modi’s rise to the post of BJP state unit’s general secretary also boded well for Shah whose first of four MLA stints came in a by-election win from Sarkhej. By the turn of the century, Shah’s growing influence in Gujarat politics was a much talked about even as an ageing Advani held on to the far more significant post of the country’s Home Minister in the Vajpayee-led government. Modi’s rise to the CM’s post in Gujarat furthered the political prospects for Shah even as Congress kept BJP at bay for ten years – between 2004 and 2014. In this decade, BJP’s role in national politics was restricted to being in the opposition which also meant Advani, in his 80s now, was devoid of any significant political role. By the time the political bugle of 2014 Lok Sabha election was sounded, BJP had begun looking at Modi to spearhead the anti-Congress drive. And even as Advani, and some other veterans of BJP were made members of the party’s Margdarshak Mandal, Shah was expected to now play a much more major national role. The massive mandate for BJP only underlined Shah’s political achievements and electoral abilities – qualities he would be banking upon to help him pass the Lok Sabha test. At 91, Advani’s vast experience would still favour BJP even as the party now calls upon its chief in Shah to lead the charge in Gujarat.